2 by 3 Heroes: Good day sunshine! The end has arrived. I had a blast sorting and showing off the generosity of Wes over these past 10 days, and we have reached the pinnacle of the gifts, even though there are no Pinnacles in this scan. 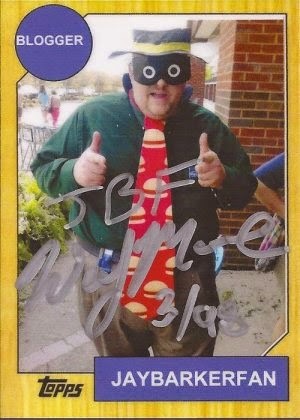 Without further delay, let's show off the super rare and unique cards Wes included, and the cryptic statement on the side of the box will finally be understood. 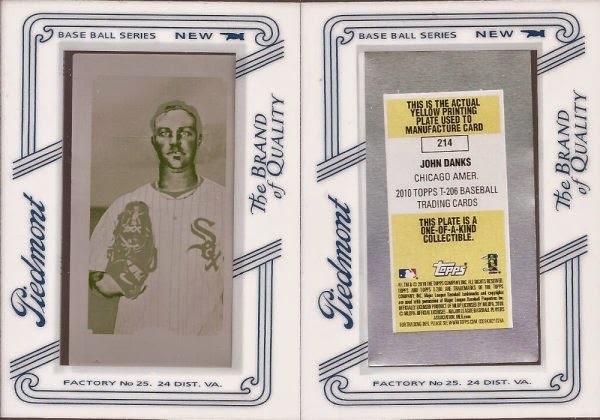 I pulled a card similar to this out of a blaster of 2014 Heritage. But that is numbered to 50, and it's not a White Sox. 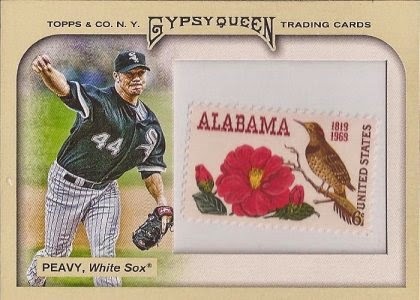 This 2011 GQ release is numbered to 10, and a team I collect, which combined together makes for a sweet addition. 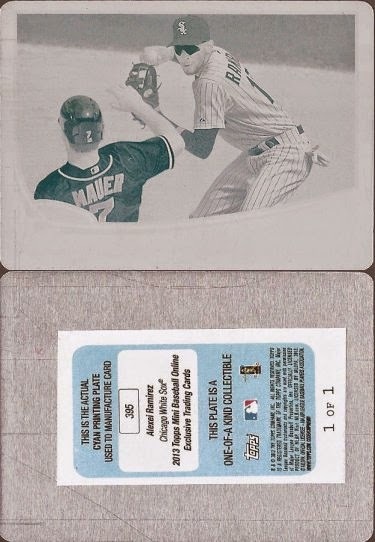 The start of the 1/1s. Yes - I said "start", implying plural. 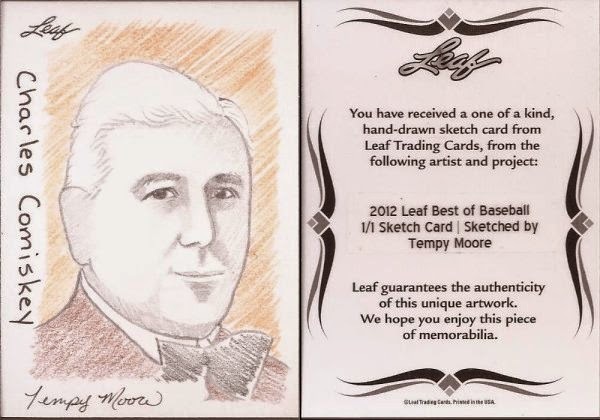 I have only one other sketch card in my collection, and I pulled that from a pack of Star Wars Galaxy. Such a unique collectable. Tempy Moore has a lot of talent, so it's a nice addition to my binder. I have pulled two plates in my life. First was a Verlander Bowman, which I sent to Hot Corner Cards. Second is a autographed Bowman Chrome Johnny Field I currently have on Ebay. At this time of typing, there are no bids, so if someone wants to trade me for it, email me quickly and I'll pull it down. But back to this plate. It's a fine replacement for that Field I am looking to send out of 2x3 headquarters. Sticking with yellow, but moving to the 206 release. I like how these mini plates are framed. While I couldn't get into the main 206 cards, I should consider the minis. I think they work nicer as a set. 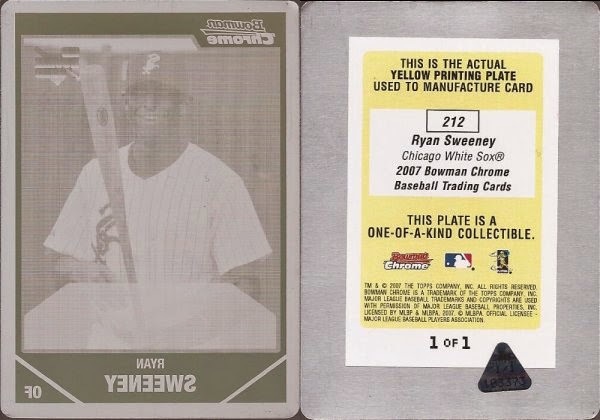 Third and final plate is this cyan from the 2013 Topps minis. It's a DP turn too. Oh, the dilemma of what binder to store this in. However, here comes the big hit of the box, and for a nerd like me, something that brings me back to being 13. I've done some amazing things in my Star Wars "career". I've hung out and drank with Chewie. took part in two charitable movie premiers, meet plenty of the actors from the movies - this is a great addition to my SW collection. When I opened the mini box, I saw the thickness of this card and knew it was the one item that Wes felt would be the biggest gift to me out of all the cards he sent, and he wasn't wrong. Again, and I may have said it too much, but not enough - thanks for your generous heart, Wes. 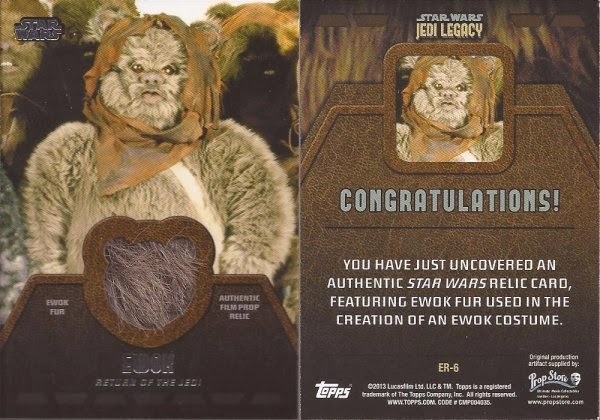 That Ewok relic card is too much. Wes is the man! Love the Peavy stamp and Ewok merkin!